The Archbishop of Canterbury is the chief bishop and principal leader of the Church of England, the symbolic head of the worldwide Anglican Communion and the diocesan bishop of Canterbury, the see that churches must be in communion with in order to be a part of the Anglican Communion. The current archbishop is Justin Welby. He is the one hundred and fifth in a line that goes back more than 1400 years to St Augustine of Canterbury, who founded the oldest see in England in the year 597 C.E. From the time of St Augustine until the sixteenth century, the Archbishops of Canterbury were in full communion with the Roman Catholic Church. During the English Reformation the church broke away from the authority of the Pope and the Roman Catholic Church, at first temporarily and later more permanently. Since then they have been outside of the succession of the Roman Catholic Church's hierarchy and have led the independent national church. In the Middle Ages there was considerable variation in the nomination of the Archbishop of Canterbury and other bishops. At various times the choice was made by the canons of Canterbury Cathedral, the King of England, or the Pope. Since the English Reformation, the Church of England has been more explicitly a state church and the choice is legally that of the British crown; today it is made in the name of the Sovereign by the Prime Minister, from a shortlist of two selected by an ad hoc committee called the Crown Nominations Commission. Successive archbishops have given distinguished leadership to the Church and service to the nation. In the second half of the twentieth century, they enthusiastically embraced ecumenism and Inter-religious Dialogue helping both church and nation to adjust to the realities of an increasingly pluralist society. Some question the Archbishop's automatic leadership of the world-wide Anglican community, which they criticize as a relic of colonialism. If the Church of England were to be disestablished, the role of the Archbishop would also change. Given the high quality of those appointed to this office, the voice of future archbishops is likely to continue to be heard in support of cooperation with others to build a better world, regardless of their political status. He is the diocesan bishop of the Diocese of Canterbury, which covers the east of the County of Kent. Founded in 597, it is the oldest see in the English church. As Primate of All England, he is the senior primate and chief religious figure of the Church of England (the British sovereign is the "Supreme governor" of the church). Along with his colleague the Archbishop of York he chairs the General Synod and sits or chairs many of the church's important boards and committees; power in the church is not highly centralized, however, so the two archbishops can often lead only through persuasion. The Archbishop of Canterbury plays a central part in national ceremonies such as coronation of the British monarch; thanks to his high public profile, his opinions are often in demand by the news media. As spiritual leader of the Anglican Communion, the archbishop, although without legal authority outside England, is recognized by convention as primus inter pares ("first among equals") of all Anglican primates worldwide. Since 1867 he has convened more or less decennial meetings of worldwide Anglican bishops, the Lambeth Conferences. However, the wider Anglican communion play no role in the appointment of a new archbishop. In respect of the last two of these functions, he has an important ecumenical and interfaith role, speaking on behalf of Anglicans in England and worldwide. Since Henry VIII broke with Rome, the Archbishops of Canterbury have been selected by the English (British since the Act of Union in 1707) monarch. Today the choice is made in the name of the Sovereign by the prime minister, from a shortlist of two selected by an ad-hoc committee called the Crown Nominations Commission. 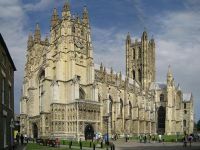 Since the twentieth century, the appointment of Archbishops of Canterbury conventionally alternates between Anglo-Catholics and Evangelicals. The current archbishop, Justin Welby, the 105th Archbishop of Canterbury, was enthroned at Canterbury Cathedral on February 4, 2013. As archbishop he signs himself as + Justin Cantuar. His predecessor, Rowan Williams, 104th Archbishop of Canterbury, was enthroned at Canterbury Cathedral on February 27, 2003. Immediately prior to his appointment to Canterbury, Williams was the Bishop of Monmouth and Archbishop of Wales. On March 18, 2012, Williams announced he would be stepping down as Archbishop of Canterbury at the end of 2012 to become Master of Magdalene College, Cambridge. Chancellor of Canterbury Christ Church University. The Archbishop of Canterbury is also a President of Churches Together in England (the ecumenical council). Geoffrey Fisher, 99th Archbishop of Canterbury was the first since 1397 to visit Rome, where he held private talks with Pope Paul VI. In 2005, Rowan Williams became the first Archbishop of Canterbury to attend a papal funeral since the reformation. He also attended the enthronement of Benedict XVI. The 101st archbishop, Frederick Donald Coggan was the first to attend an enthronement, that of Pope Jean-Paul II. Since 2002, the Archbishop of Canterbury has co-sponsored the Alexandria Middle East Peace process with the Grand Mufti of Egypt. In July 2008, the Archbishop attended a conference of Christians, Jews and Muslims convened by the king of Saudi Arabia at which the notion of the Clash of the Civilizations was rejected. Delegates agreed "“on international guidelines for dialogue among the followers of religions and cultures.” Delegates said that "the deepening of moral values and ethical principles, which are common denominators among such followers, would help strengthen stability and achieve prosperity for all humans". As primate of the Anglican Communion, the Archbishop of Canterbury also serves the world; they thus also address global issues of peace, justice and the integrity of creation. It has been suggested that the Roman province of Britannia had four archbishops, seated at London, York, Lincoln, and Cirencester. However, in the fifth and sixth centuries Britannia began to be overrun by pagan, Germanic peoples who came to be known collectively as the Anglo-Saxons. Of the kingdoms they created, Kent arguably had the closest links with European politics, trade and culture, due to the fact that it was conveniently sited for communication with the Continent. In the late sixth century, King Æthelberht of Kent married a Christian Frankish princess named Bertha, possibly before becoming king, and certainly a number of years before the arrival of the first Christian mission to England. He permitted the preaching of Christianity. The first Archbishop of Canterbury was St. Augustine, who arrived in Kent in 597 C.E., having been sent by Pope Gregory I on a mission to the English. He was accepted by King Æthelbert, on his conversion to Christianity, in about the year 598. It seems that Pope Gregory, ignorant of recent developments in the former Roman province, including the spread of the Pelagian heresy, had intended the new archiepiscopal sees for England to be established in London and York. In the event, Canterbury was chosen instead of London, owing to political circumstances. Since then the Archbishops of Canterbury have been referred to as occupying the Chair of St. Augustine. Before the break with Papal authority in the sixteenth century, the Church of England was an integral part of the continental Western European Church. Since the break the Church of England, an established national church, still considers itself part of the broader Western Catholic tradition as well as being the "mother church" of the worldwide Anglican Communion, though no longer in communion with the See of Rome. Along with primacy over the Archbishop of York, the Archbishop of Canterbury also has a precedence of honor over the other archbishops of the Anglican Communion. He is recognized as primus inter pares, or first amongst equals. The Archbishop of Canterbury, however, does not exercise any direct authority in the provinces outside England. Both the Archbishops of Canterbury and York are styled "The Most Reverend"; retired archbishops are styled "The Right Reverend." Archbishops are, by convention, appointed to the Privy Council and may, therefore, also use "The Right Honourable" for life (unless they are later removed from the council). In formal documents, the Archbishop of Canterbury is referred to as "The Most Reverend Father in God, Forenames, by Divine Providence Lord Archbishop of Canterbury, Primate of All England and Metropolitan." In debates in the House of Lords, the archbishop is referred to as "The Most Reverend Primate, the Archbishop of Canterbury." "The Right Honourable" is not used in either instance. He may also be formally addressed as "Your Grace" - or, more often these days, simply as "Archbishop," "Father" or (in the current instance) "Dr Williams." The surname of the Archbishop of Canterbury is not always used in formal documents; often only the forenames and see are mentioned. The archbishop is legally entitled to sign his name as "Cantuar" (from the Latin for Canterbury). The right to use only a title as a legal signature is only permitted to bishops and Peers of the Realm. The current Archbishop of Canterbury usually signs as "+ Rowan Cantuar." In the order of precedence, the Archbishop of Canterbury is ranked above all individuals in the realm, with the exception of the Sovereign and members of the Royal Family. Immediately below him is the Lord Chancellor, and then the Archbishop of York. The Archbishop of Canterbury's official residence in London is Lambeth Palace. Until the nineteenth century there were also major residences at Croydon Palace and Addington Palace. At one time there was also a palace in Maidstone in Kent, now called the Archbishop's Palace. There are ruins of another former palace at Otford in Kent. The Archbishop of Canterbury has the authority to confer degrees. Before the reformation, the papal legate had this power. In 1553, the British parliament passed an enabling Act allowing the Archbishop to continue this practice. This authority was renewed under the 1988 Education Reform Act. He awards doctorate and masters degrees. The former, usually in divinity, music or letters are not considered honorary but recognize achievements equivalent to an earned degree. Masters are also awarded in the same way or may be earned by thesis. The Archbishop also awards the S.Th. diploma. This is by examination or for a thesis. Graduates, by tradition, wear the academic dress of the University of which the which the current archbishop's alma mata. Until the appointment of George Carey, the 103rd archbishop, this had always been Oxford or Cambridge. He was a University of London graduate but chose Oxford regalia for those on whom he conferred degrees. Augustine. 597 to 604/5. The first Archbishop and the first to be canonized. Anselm. 1093 to 1109. 36th archbishop; one of the founders of scholasticism; is famous as the originator of the ontological argument for the existence of God. One of the few senior bishops who opposed the Crusades. Thomas Becket.40th archbishop. 1162-1170. Served Henry II as Chancellor. Was murdered and canonized. Subsequently, Canterbury became a place of pilgrimage, immortalized by Geoffrey Chaucer's Canterbury Tales. Thomas Cranmer. 1533 to 1555. 69th Archbishop. Under Henry VIII oversaw the breach with Rome. Wrote the first Book of Common Prayer and set the doctrinal standards of the reformed church. He was executed as a heretic when Mary I became Queen. William Laud. 1633 to 1645. 76th archbishop. As chancellor of Oxford University, he wrote new statutes and endowed the Chair in Arabic. He was beheaded as a royalist during the English Civil War. Briefly First Lord of the Treasury, he was one of the last Archbishops to exercise real political power. Although his legacy is controversial, he did much to position Anglicanism mid-way between Catholicism and Protestantism, retaining the episcopacy and apostolic succession but questioning the supremacy of the pope. William Temple. 1942-1944. 98th archbishop. His father, Frederick Temple was the 95th. Although only briefly archbishop, Temple is considered one of the most distinguished theologians to occupy the see of Canterbury since Anselm. He is especially remembered for his transformational theology that called for action in the world, in God’s name, not merely for the adoration of that name within the church. Given that the appointment of the Archbishop has a political aspect, it is not surprising that some outstanding men who might have been appointed were passed over. One such man was George Bell, whose criticism of the saturation bombings of Germany during World War II is said to have cost him translation from Chichester. Incumbents have also attracted criticism for failing to please the government of the day. The archbishop, Robert Runcie "incurred the wrath of Prime Minister Margaret Thatcher when he prayed for both British and Argentine victims" at a 1982 service of commemoration for the recapture of the Falkland islands. Rowan Williams, on the eve of his appointment, condemned the 2003 invasion of Iraq "immoral and illegal." As Britain becomes increasingly multi-cultural and pluralist, debate has taken place about whether it is appropriate for the Archbishop of Canterbury and for other senior bishops to continue to serve in the House of Lords. Recent archbishops have supported interfaith dialogue and sponsor an annual interfaith lecture, established by Donald Coggan. The archbishops have supported making space for representatives of other faiths in military and hospital chaplaincies and well as on radio and television. However, Anglican bishops are the only people who automatically sit in the Lords by virtue of their office (since, 1999 most hereditary peers no longer sit in the house.) There are peers who actively belong to other faiths and to other Christian denominations but with some exceptions, they have been appointed because of their achievements in other fields. When consulted about extending membership to other office holders some people object based on their preference for the complete separation of church and state, or of religion and the state. The bishops themselves have "consistently supported an expansion of the upper house to include Jewish, Sikh and Muslim members." The government has resisted automatic representation of leaders of other faiths because of practical obstacles, such as the large number of denominations and faiths. An Archbishop of Canterbury without a seat in the Lords might have less moral authority and less opportunity to speak on social and other important issues. However, the senior Catholic bishop in England, the Archbishop of Westminster, who does not sit in the Lords still attracts media attention for his views and opinions. Some view the spiritual lords as an anachronism, given the small percentage of people who attend any church. Others would be happy to see distinguished religious service as one criterion alongside others, such as service to the arts, to education, to medicine and to sport for appointment to the chamber, if it continues to consist if appointees and does not become an elected chamber. In contrast to the reserved seats held by bishops in the Lords, until 2001, clergy of the Church of England could not sit in the House of Commons. Reed argues that bishops and other religious representatives should continue to have a place "in the law making institutions of the land" where they can represent "values other than individual liberty." Vyver and Witte speculate whether at a future coronation of a British monarch, the Archbishop of Canterbury might be joined by leaders of other faiths helping to lead the ceremony, which would be "of enormous symbolic influence" recognizing that "Britain is a multi-faith society." ↑ Archbishop's Roles and Responsibilities. Archbishop of Canterbury. Retrieved January 21, 2009. ↑ Madrid Interfaith Dialogue Conference: Beginning of a Process. Saudi-US Relations Information Service July 19 2008. Retrieved January 21, 2009. ↑ JPIC is a process initiated by the World Council of Churches to which the Anglican Community and the Archbishop of Canterbury are committed; it aims to make commitment to justice, peace and the integrity of creation central to all programs and activities. See D. Preman Niles, Resisting the threats to life: covenanting for justice, peace, and the integrity of creation (Geneva, CH: WCC Publications, 1989, ISBN 978-2825409640). ↑ J. Wacher, The Towns of Roman Britain (London, UK: Batsford, 1974, ISBN 9780713473193). Especially pages 84-86. ↑ H. Thurston, Bertha The Catholic Encyclopedia (New York, NY: Robert Appleton Company, 1907). Retrieved April 11, 2016. ↑ Nicholas Brooks, The early history of the Church of Canterbury: Christ Church from 597 to 1066 (Leicester, UK: Leicester University Press, 1984, ISBN 978-0718511821), 3-14. ↑ Joseph Whitaker, Whitaker's Almanack 2008 (London, UK: A & C Black Publishers Ltd., 2007, ISBN 978-1414433448), 43. ↑ Geoffrey Chaucer, Larry Dean Benson, The Canterbury Tales: Complete (Boston, MA: Houghton Mifflin, 2000, ISBN 978-0395978238). ↑ J.D. Van der Vyver and John Witte, Religious human rights in global perspective: legal perspectives (The Hague, NL: M. Nijhoff Publishers, 1996, ISBN 978-9041101778), 217. ↑ Jonathan Petre, Archbishop Attacks Iraq Invasion Plan. The Telegraph, 2002. Retrieved January 21, 2009. ↑ Stephen V. Monsma and J. Christopher Soper, The Challenge of Pluralism: Church and State in Five Democracies (Lanham, MD: Rowman & Littlefield Publishers, 2009, ISBN 978-0742554160). 142. ↑ Monsma and Soper, 2009, 146. ↑ Vyver and Witte, 1996, 216-217. Brooks, Nicholas. 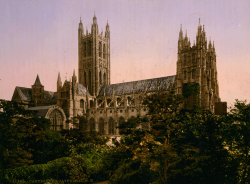 The early history of the Church of Canterbury: Christ Church from 597 to 1066. Studies in the early history of Britain. Leicester, UK: Leicester University Press, 1984. ISBN 978-0718511821. Carpenter, Edward. Cantuar: the Archbishops in their office. London, UK: Cassell, 1971. ISBN 978-0304938506. Chapman, Mark D. Anglicanism: A very Short Introduction. Very short introductions. Oxford, UK: Oxford University Press, 2006. ISBN 978-0192806932. Lamb, John William. The Archbishopric of Canterbury, from its Foundation to the Norman Conquest. London, UK: Faith Press, 1971. Maxwell-Stuart, P.G. The Archbishops of Canterbury. Stroud, UK: Tempus, 2006. ISBN 978-0752437286. Monsma, Stephen V., and J. Christopher Soper. The Challenge of Pluralism: Church and State in Five Democracies. Lanham, MD: Rowman & Littlefield Publishers, 2009. ISBN 978-0742554160. Niles, D. Preman. Resisting the Threats to Life: Covenanting for Justice, Peace, and the Integrity of Creation. Risk book series, no. 41. Geneva, CH: WCC Publications, 1989. ISBN 978-2825409640. Podmore, Colin. Aspects of Anglican identity. London, UK: Church House, 2005. ISBN 978-0715140741. Reed, Esther ED. "Reform of the House of Lords and Christian Responsibility in a Plural Society." in International Academy of Practical Theology, Elaine L. Graham, and Anna Rowlands. 2005. Pathways to the public square: practical theology in an age of pluralism; International Academy of Practical Theology, Manchester 2003. International practical theology, vol. 1. Münster, DE: Lit ISBN 978-3825884239. Van der Vyver, J.D., and John Witte. Religious human rights in global perspective: legal perspectives. The Hague, NL: M. Nijhoff Publishers, 1996. ISBN 978-9041101778. Ward, Kevin. A history of global Anglicanism. Cambridge, UK: Cambridge University Press, 2006. ISBN 978-0521803953. Whitaker, Joseph. Whitaker's Almanack 2008. London, UK: A & C Black Publishers Ltd., 2007. ISBN 978-1414433448. History of "Archbishop of Canterbury"
This page was last modified on 6 October 2016, at 16:20.